Scratch Remover for iPods / White iBook & White MacBook . iCleaner Pro Kit - The iCleaner Scratch Remover is one of the most advanced polishes on the market. It is so powerful that it will remove the scratches and swirls from the metal back of your iPod without harming the laser engraving, and will even get deep scratches out off the white plastic surfaces. It is a non - abrasive alcohol free cleaner that removes scratches from the white/black & clear plastic of your iPod (including the new 5th generation video iPod, nano, mini, U2, iPod photo and shuffle) or from the white iBook's scratch prone surface and from the white MacBook. This bottle of the iCleaner scratch remover will last for up to 20 iPods. The iCleaner Scratch Remover is available in the iCleaner Pro Kit. 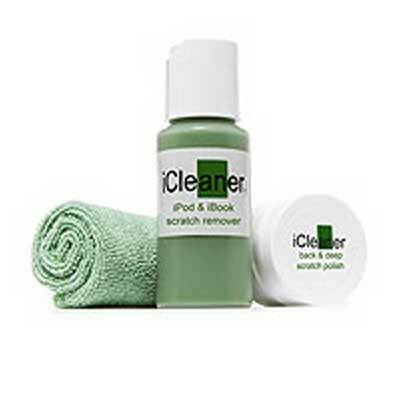 Please Note: iCleaner is only to be used on iPods & White iBook & White MacBook to remove scratches. It is not a screen cleaning product. Products sold through this Web site that do not bear the iKlear or Klear Screen name are serviced and supported exclusively by their manufacturers in accordance with the terms and conditions packaged with the products. Meridrew Enterprises' Limited Warranty does not apply to products that are not iKlear or Klear Screen branded, even if packaged or sold with Meridrew products.